Quick Poll is released under GPLv2 license. 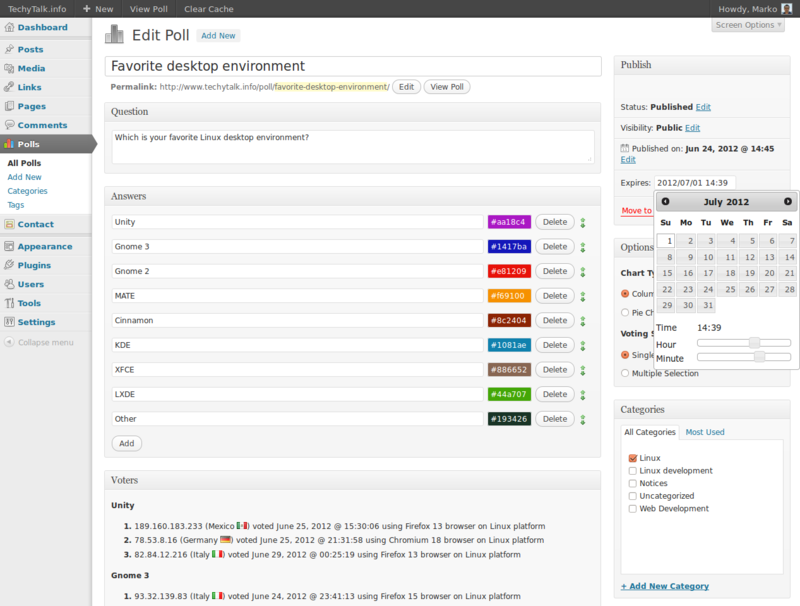 Quick Poll is modern WordPress plugin allowing you to host interactive voting polls on your WordPress site or blog. What separates Quick Poll from other voting poll solutions is level of WordPress integration and control you have over this open source plugin. Quick Poll is using modern WordPres versions support for custom post types to control voting polls in the same familiar manner as you control regular posts and pages. Since Quick Poll is software protected by GPLv2 open source license, you have total freedom in using and modifying Quick Poll code. On top of that by paying download and support fee you get one year of plugin updates and one year of my support to easily integrate Quick Poll into your blog or site. 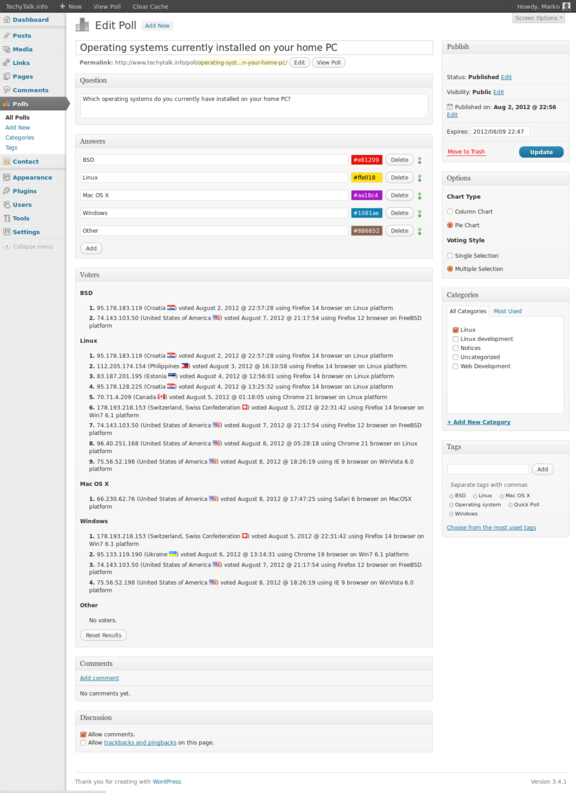 Self hosted solution, all voting poll data is stored inside your own WordPress database under your own control. Self hosted also means unlimited number of voting polls and voters. 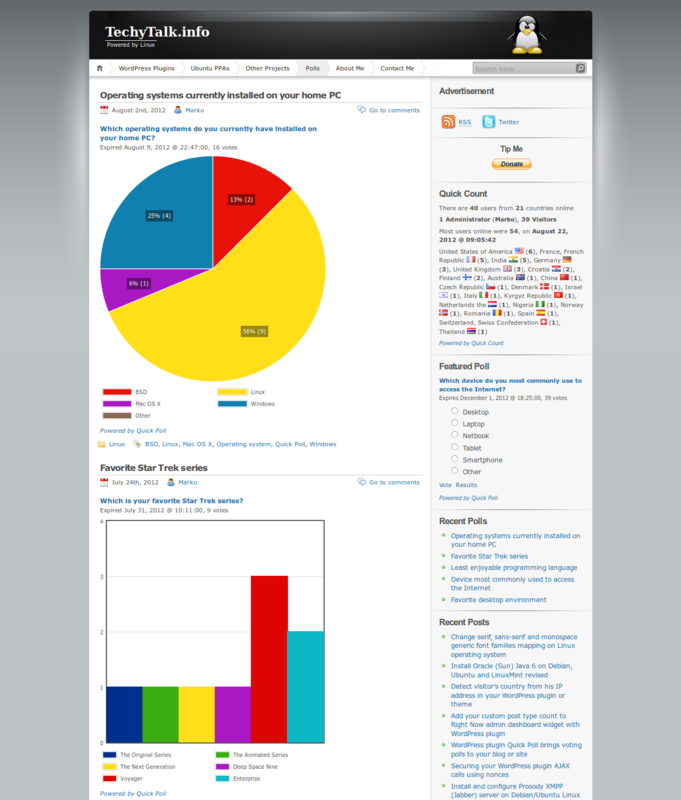 Voting poll results can be presented using two chart types, column chart and pie chart. You can use color picker to customize colors used to display voting poll results for both poll results chart types. You can use expiry date and time picker to choose when will your voting poll end. You can create two voting poll types, one to allow single option selection and other to allow multiple option selection. Quick Poll comes with two sidebar widgets. 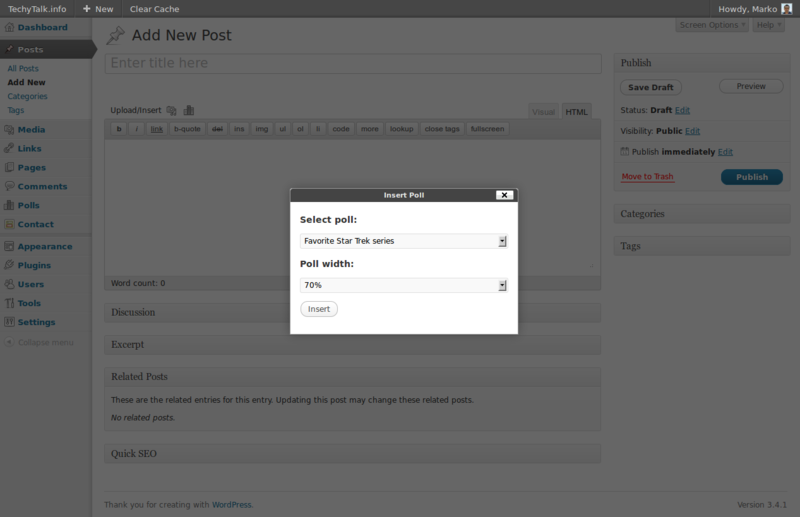 You can use Featured Poll widget to display one voting poll per widget instance in your blog or site sidebar. You can use Recent Polls widget to display selected number of recently published polls. Quick Poll comes with shortcode allowing you to place your voting polls anywhere into your existing or future posts or pages. On your new post screen Quick Poll ads convenient button allowing you to quickly insert shortcode for one of your existing voting polls. 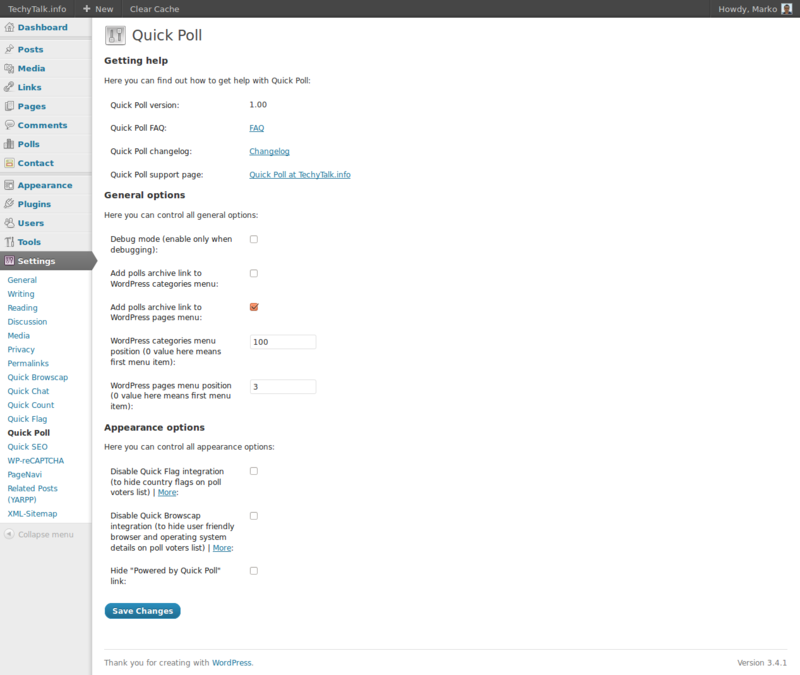 Quick Poll is using custom post type WordPress feature to publish and edit voting polls in the same familiar manner as you control regular posts and pages. While creating your voting polls you can save poll drafts, add voting poll excerpt and publish voting poll or configure it to be published automatically at future date. Your voting polls can be sorted using familiar system of WordPress tags and categories. Quick Poll supports voting poll archive. Voting poll archive can be filtered based on poll publishing date. You can even create custom WordPress theme template file for your poll archive pages. 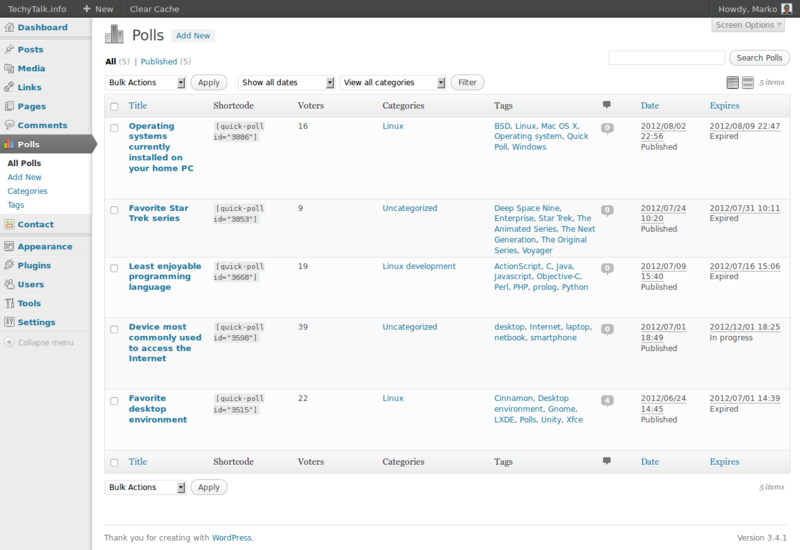 Quick Poll can automatically place your poll archive link inside your pages or categories menu. In addition to displaying voting polls using sidebar widget and shortcode, each voting poll gets its own page where users can vote, review results or leave their poll comments. You can even create custom WordPress theme template file for your voting poll pages. 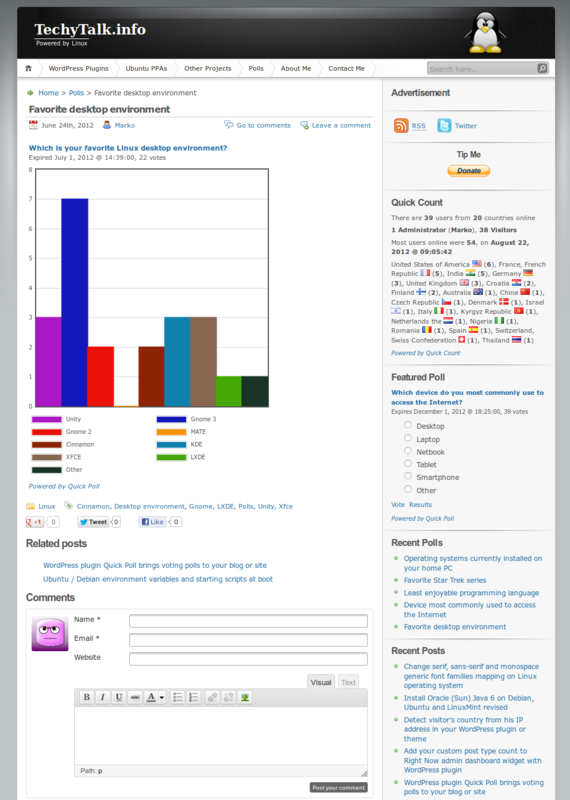 Quick Poll can detect poll voters country (using my free and open source WordPress plugin Quick Flag). Quick Poll can also detect voters browser and operating system. 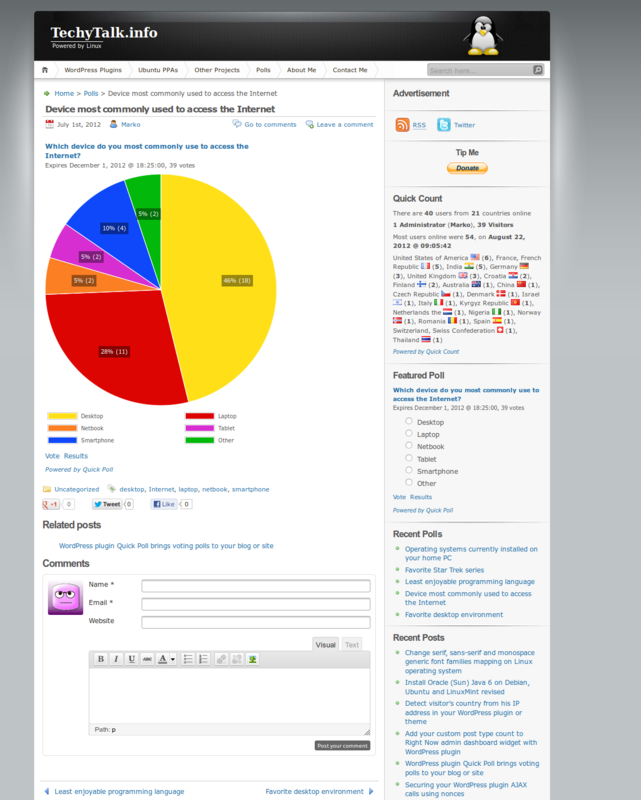 Using this information Quick Poll creates detailed poll voters statistics for each voting poll. Quick Poll supports PHP caching WordPress plugins like WP Super Cache or W3 Total Cache. 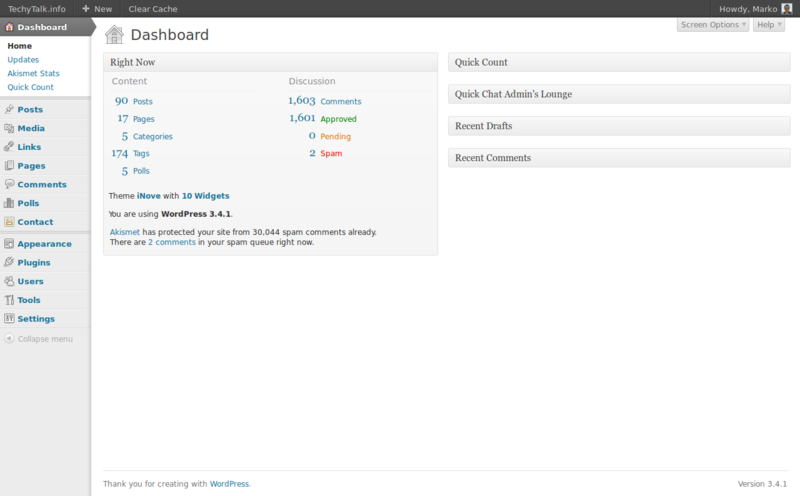 Go to your admin dashboard -> Plugins > Add New. Under Upload, click browse and select Quick Poll zip package. Have fun hosting voting polls on your WordPress site or blog. If you need more info about Quick Poll you can use following form or post your comment here and I'll answer as soon as possible. If you need support for your Quick poll installation you can also use this form, but please include your PayPal transaction ID and I'll provide you with support within 24 hours from your support request. Make Quick Poll work better with SSL related plugins installed. Quick Poll is free ("free" as in "free speech", not as in "free beer") and open source software. Quick Poll download and 1 year of premium customer support and software updates costs 20$. Hi, where is an download link? As you saying its free and open here on your website is only buy now link..could you send me the link or where I can download it.. I cannot find it on wp repos as well..
Basically free software guarantees your freedom to freely use it, not to be able to get it free of charge. Quick Poll download costs 20$ and comes with 12 months of my support, but Quick Poll code it self is free to use under GPLv2 open source license (but not free of charge). Legally since WordPress is open source software released under GPLv2 all WordPress plugins MUST be distributed under the same open source license (free of charge or not). I would prefer a lite (free) version and a pro (paid) version. Often I only need a few features and don’t need megaware, free or otherwise. For example, I like Quick Chat and have it installed (thanks for a great plugin! 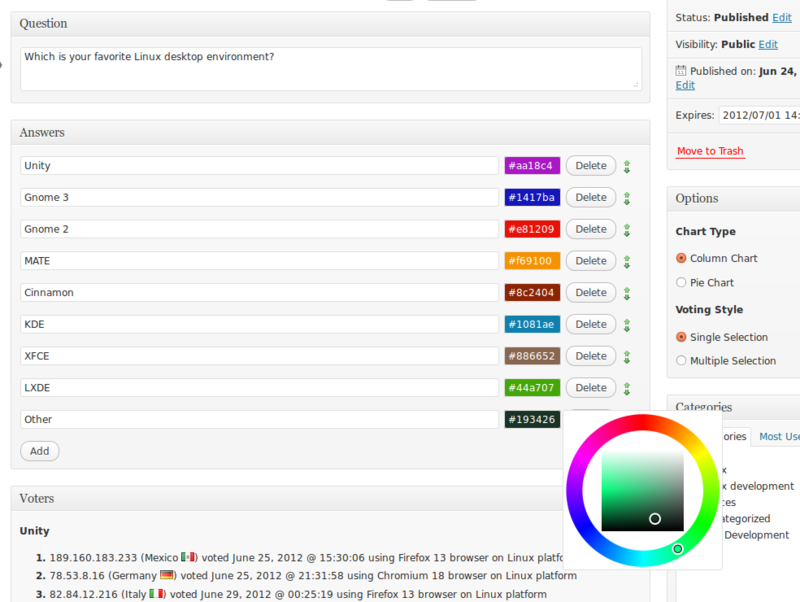 ), but I would pay $20 in order to have a multi-person private chat feature and style/color editor activated. Hm, excuse me. I just bought ‘Quick Poll download and 1 year of premium customer support and software updates’, but I didn’t get directed to a link or whatsoever to download it? first of all thank you for your payment. Unfortunately you have used an eCheck to make your payment. According to PayPal it usually takes between 3-5 days for me to confirm your payment and receive the money, that’s why you haven’t received the download link. Is it OK with you that I use the email address you have provided to PayPal to notify you when your payment has been confirmed? Oh God, yes. I see it now. I thought I had paid with my creditcard. Forgot I didn’t connect it to my PayPal account yet. Is it possible to cancel the order and to place a new order with my creditcard you think? I’ve been eyeballing PayPal interface for 10 minutes, there’s an “Issue refund” button but it seems that full refund would deduct some part of PayPal transaction fee from my account. I can do this only after I receive your new “Instant” type of payment, OK? Sorry, forgot about it! Guess I’ll just keep it like this then. Did the eCheck arrive already? unfortunately not yet, probably due to holidays. I’ll send you an email with instructions and download link as soon as it arrives. your payment has been cleared and I have sent you your Quick Poll package. If you require any support please don’t hesitate to use Quick Poll support form. I purchased Quick Poll with PayPal, it’s not an eCheck as far as I know because it’s linked to my account which is funded. How do I get the download please. sorry for the delay in processing your request. Your payment is fine and I’ve sent you your Quick Poll package by email. Quick Poll looks amazing! I have a question: can I limit voting to only certains types of visitors? Say I have editors judging something and I want the ongoing tally visible to others. Would it be possible to make only editors able to vote? If so, could I also make sure only logged in editors could see the voting buttons? unfortunately out the box this isn’t possible and whoever didn’t already voted, get’s to vote. This is a good idea though and limiting polls to specific roles might be implemented in the future. Hi there, I am thinking of using your plugin on a website I am working on, but cannot find where it is I need to go to purchase it via PayPal? Please let me know.